This product will not work in USA, Canada, Japan and other countries with 100-120V, unless you are using a step-up converter. 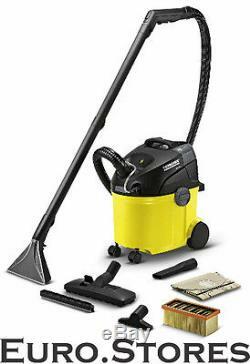 Karcher SE 5.100 Wet & Dry Hard Floor Vacuum Cleaner 1.081-200.0 Genuine New. Everywhere where fibre-deep and hygienic cleaning is needed, comes the hard floor and carpet cleaner SE 5.100. The cleaning liquid is sprayed deep into the carpet with pressure and again sucked along with the loosened dirt. Grease, dirt and odors are removed so carefully. The standard hard surface attachment ensures streak-free clean on natural stone, tile, linoleum and plastic floors. Air flow (l / s) 70. Power consumption (W) Max 1400. (Fresh / dirty water) tank (l) 4/4. Weight without accessories(kg) 7. Dimensions (L x W x H) (mm) 370 x 290 x 470. 2 in-1 comfort system: integrated spray-ex-hose. Paper filter bag 1 piece. Washing nozzle with hard floor adapter. Accessories storage on the device. Please read our terms and conditions before purchasing from us. All packages are Trackable and will require proof of signature upon receiving. Weekends and bank holidays do not apply to any of the above time frames. Customers are responsible to cover the cost of returning the package if the return reason is change of mind or order by mistake. No alternative methods are allowed. Please note that our products are coming with European Sepcifications and/or with European 2 PIN plug. The item "Karcher SE 5.100 Wet & Dry Hard Floor Vacuum Cleaner 1.081-200.0 Genuine New" is in sale since Friday, July 24, 2015.